Posted on November 3, 2015 . 11 Comments. Some of the greatest feats of strength ever recorded were done decades ago by men who had access to the most primitive equipment and knew nothing of fast twitch muscle fiber and the glycolytic systems. Hermann Goerner performed a deadlift of 727.25lbs. On an international revolving bar. With hook grip. With his right hand. Arthur Saxon routinely put 300lbs over his head with one hand like it was his job. Because it was his job. His official bent press record of 370lbs still stands today, over 110 years later. Joe Greenstein, the Mighty Atom, bent horseshoes with his teeth, broke chains with chest expansion, and stopped an airplane from taking off with his hair. All of them approached their training as a practice. Occasionally they would attempt a heavy record lift or feat in training, but think about it — if your job was lifting heavy things and bending steel with your hands, night after night as a performer, how would you approach your training? 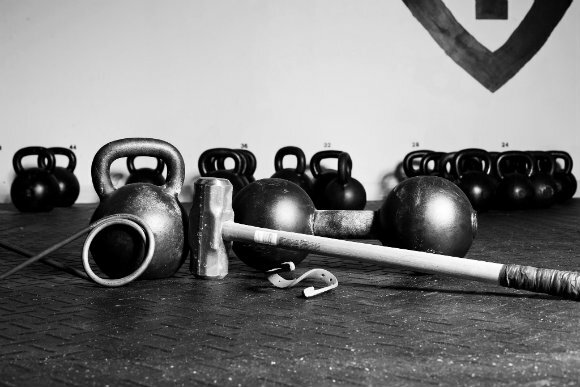 The tools of the strongman. Would you push yourself to fatigue and near exhaustion? Would you let your technique get sloppy? Would you measure success by how destroyed you were at the end of the session or how sore you were for the next few days? Nope. Not unless you wanted to wind up unemployed and broken. The “no pain, no gain” mentality will break you. I much prefer the concept of “no pain, know gain. What if you approached lifting like it was your job and you got paid to not only make the lifts, but to also to look good and be entertaining while doing it? How often would you attempt to set a new record lift one-rep maximum? How ambitious would that attempt be? Missed training (performing) time from an injury would be time you couldn’t do your job. If you don’t lift, for whatever reason, then you ain’t getting paid. You would do better to train as if your life depended on it. Not with the goal of completing one maximal lift, but as if your life depended on the completion of this feat – and the next one, and the next one, and the twelve feats in the next show at 9:00, and the two shows tomorrow, and three on Saturday that you have to do. You would not be chasing extreme effort, straining, “feeling the burn,” or pushing yourself to exhaustion. Practice vs. performance – I know the similarities and differences. Attempting a maximal lift in front of a crowd for a show is the move of an amateur (unless of course it is for a documented record). Run “wide open” all the time and something will break. The thing that breaks ain’t gonna be a record. 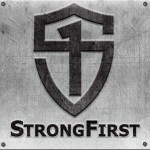 Grandmaster Strongman Dennis Rogers told me the exact same thing about practice. If you don’t know who Dennis is, search YouTube and prepare to have your mind blown. Today, at 59 years old, 5’9″, and 165lbs, he still bends wrenches, frying pans, screwdrivers, and all manner of other things. 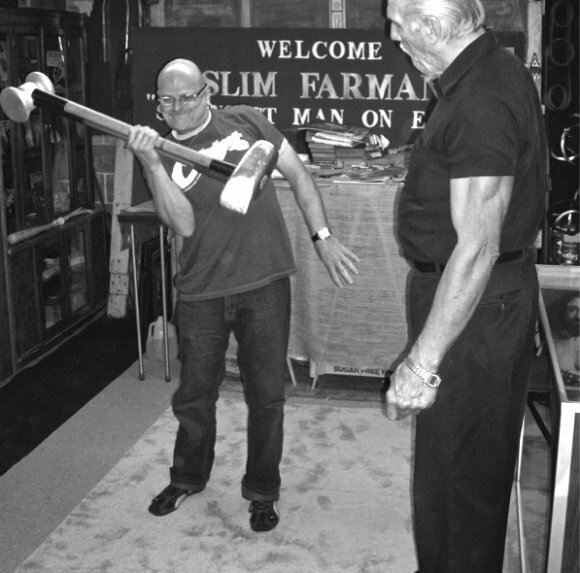 The Association of Oldetime Barbell & Strongmen proclaimed him “pound for pound the world’s strongest man for the feats he performs.” He is my mentor in the art of the old-time Strongman. Dennis Rogers curls 18lb and 32lb sledgehammers by squeezing the handles together. If you want to test yourself and see what you can do in an all-out attempt, I am certainly not opposed to it. I am a fan of occasionally flipping the “crazy switch” and seeing exactly where I stand in a given lift or feat of strength. But this should be a very infrequent thing. The majority of your training should be in the 70-85% range. In my book Taming the Bent Press, I outline several training plans that stick to this general guideline. If you constantly test the limit, you will find it. But if you constantly work within your limits and work on getting your bent press (or any other lift) better and better, then your limits will move without much effort. This calls for patience. We hit a new all-time PR, then we immediately want to see if we can do just a little more. Resist that temptation. Focus on doing just a little better instead of a little more. Strong First Master Instructor. 21st Century Old Time Strongman. 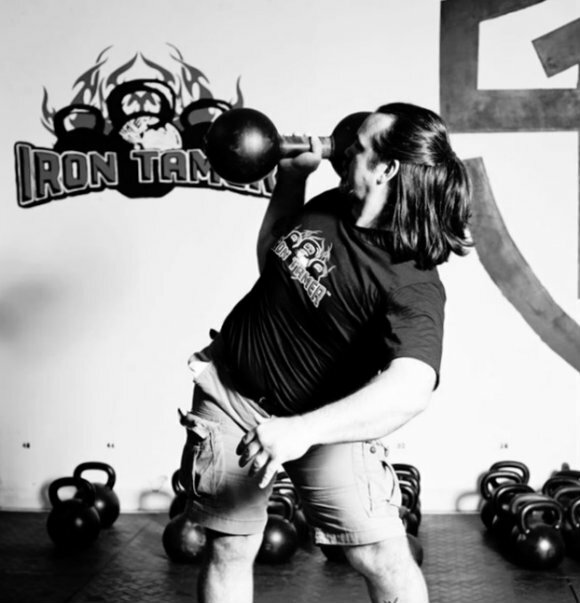 Owner of Nashville Kettlebell Lifter of heavy things, bender of steel, tatsujin. so how did these get upto those ungodly weights? Just naturally very strong? If you don’t push the weight how can you get your PR higher? If you work at say 80%..how often should you hit and try and best your PR? Outstanding article that goes without saying treating training like it was a job and ones life depended on it. Thanks for this great article Mr. Whitley. Indeed, the old folks didn’t know about fast twitch muscles etc.. Neither did they practise a lot of so called assistant exercises or corrective exercises. They only lifted and got strong! But is this the right way for normal people? I always enjoy bits about old time strongmen. Poignant and powerful article. Thank you reinforcing this message. Live well! A reminder to remind me…on the old timers, the routs. Yes, what they did is to me just otherworldly. There is no supplement/secret to develop skills. Just P&P. Patience & Practice. Only just that (besides having a mentor, as in former days knowledge/experience/wisdom was shared from teacher to student through generations) Thank you for sharing Mr. Irontamer. Another great article, Dave! Glad to read another from you. Excellent article Tamer, thank you. Thanks Dave, it’s a message you can’t hear too much!